The K587 Kenda Bearclaw HTR is one of our favorite tires and an excellent choice for ATV riders looking for a tough tire suited for all terrain. Kenda starts with an 8 ply-rated extra tough casing and radial construction. 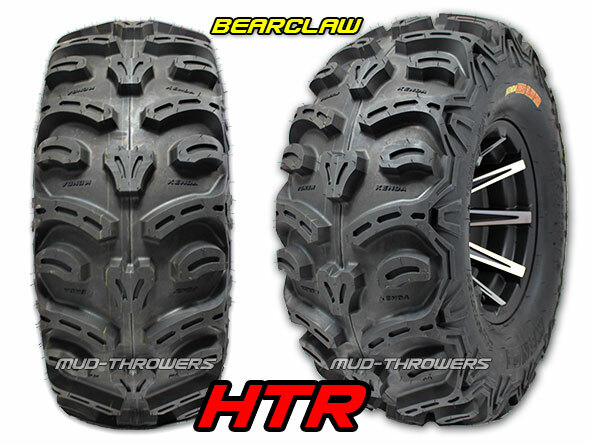 ​The Bearclaw HTR features an all new tread pattern that has maximum bite. Next they added side shoulder tread for extra protection and additional traction when you need it. The best part is the tire is incredibly light - so all that rotating mass won't bog down your motor. The radial construction means that it will ride smoother, and last longer than a bias type tire. The tread is a self-cleaning design, yet ensures maximum bite. The Bearclaw HTR ATV tire is an all around well balanced tire with many features, and great for hard pack, all terrain, desert, or mountain riding. We highly recommend this tire if you are looking for a larger diameter tire without all the weight! Keep the performance of your machine. Hey guys just an update on my bear claw htr's. I have a 2013 honda foreman 500 with the 27 inch bear claw htr's and all i can say is these tires have lasted great. I have put around 1200 miles on them rideing on mostley pavement, mud, dirt and gravel. They show very little wear and ride very nice at high speeds. 5 star rating and great service by mud throwers. Originally bought a set of 25X8 and 25X10 for 2006 Honda Rancher AT. They were better than expected, so bought a set for 2008 CanAm 800 that had too much power for the tires on it, in 26X9 and 26X11. Had to use washers on front to stop tie rod rub, but knew that might happen. Just bought a set of 25X8, 25X10s for 2011 Arctic Cat TRV after daughter got stuck in a mud hole that the two other machines walked right through. No problems now, I'll probably keep buying Bearclaw HTRs as long as the specs and price don't change too much. I don't think at tire can be found that will match the specs at the price! Mudthrowers rules, easy to order, everything arrives when they say, or before! I have now bought three sets of these from Mudthrowers. Outstanding tire and value. Needed new tires on our Honda 450AT. Gave these a try, with a set of steel wheels to make all my machines have 12" rims. Liked them so much, bought a set for CanAm 800 that the stock tires just wouldn't cut it. Again, loved them. After a ride where these two machines went right through the mudhole and the Arctic Cat got stuck, my wife said "guess you had better put a set of these good tires on that one too." So I did. Very happy with these, if the price doesn't increase, I'll probably get them again next time one of the machines need tires.